Yes we lost but tonight we got a chance to see the real character of our team. All 4 lines putting in gritty shifts, the defense actually making defensive plays, Marc Andre Fleury putting on another great performance, though not so much in the shootout. Getting a point against the "highly talented offense" of the Caps is partially a win in my book. Without the services of Sergei Gonchar and Evgeni Malkin, guys needed to step up and they did. Max Talbot finally got on the board with a goal even if he did deflect it in and Goose and Tanger played a much improved defensive game. No one said this was going to be a cake walk, we all know that but we also know what this team is capable of doing. What they are capable of has not been showing and they need to press the play button. The first period of hockey was probably the best we have seen in a while. Both and forth action, great goal tending on both ends. I don't know about you, but I felt pretty good going into the second period with no score. The second period rolls around and we all still feeling pretty good, until the Caps get an amazing amount of luck about Backstrom takes a shot that deflects off of Fleury's pad straight up in the air, the puck ends up coming back down right behind Flower. Not only was puck behind Fleur but so was Mike Knuble. Luck in my opinion. The Caps didn't last too long as Max Talbot deflects in a goal his first goal in what seems like forever. The Pens PP goes to work and gets on the board putting the boys up 2-1. Crosby takes the center lane and uses the back hand pass to find Guerin who puts it home. The second period ends with the Pens up 2-1. We can breath, only 20 minutes to go. An early third period powerplay for the Pens, a chance to go up by 2 and get more momentum. Well Alex Semin didn't like the thought of that because she goes and scores a short handed goal. In my opinion, Semin scored due to a break down of communication between Goligoski and Letang. Goose drops back in order to direct Letang which allows Semin the center of the ice and the ability to pick his shot spot. Semin gives the Caps a huge momentum swing and they fed of that goal for sure. Eric Fehr redirects a Mike Green shot to put the Caps up 3-2. Jay McKee pulls a Hal Gill on Flower and screens him, Fehr is there on the door step. At this point we are all preparing ourselves for another lose, but Jordan Staal gave us some life with a wicked shot over Theodore's shoulder to tie up the game. 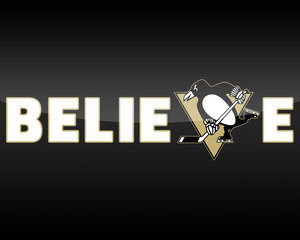 Overtime it is, we know for sure the Pens get a point a point out of this game. We got a couple nice looking chances in OT but obviously couldn't capitalize but neither could the Caps. It was down to a shootout. Letang scores first on Theodore and Fleury stops Backstrom. Crosby scores on Jose but Ovie scores on Flower. Billy G was next up, yes Billy G in a shootout. Stopped by Theodore. Semin scores, Kunitz is stopped. Knuble scores for the Caps. Game. Frustration, a lot of it. "Maybe I'm in the minority here, I'm getting tired of hearing that we played hard and we should have deserved better," Orpik said. "We're not winning hockey games, and that's what it comes down to. I don't know. I don't feel very good leaving the rink when you lose, no matter how you played..."
Saturday we take on the Flyers, expect a big game from our guys.